Equipment : Air conditioner / AM-FM & CD / Vaccum and voltage meters. Water and exhaust temp. meters. This is our brothers' garage. My younger brother's RacingKarts in the garage. 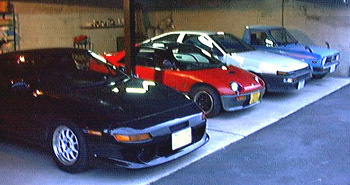 There are 4 favorite cars in our car shed. Black is TOYOTA MR-2 (SW20) marked 350PS. Blue pickup is Nissan Sunny Truck. This is dwarf puffer called "Avenny Puffer" in Japan.